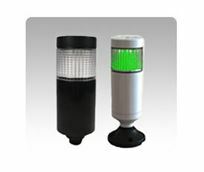 Menics NEW56mmø ultra-bright tri-color LED tower lights are available in RED-YELLOW-GREEN or RED-BLUE-GREEN color combinations. These innovative design 3 LED in 1 lights are cost & energy efficient compared to the conventional stack lights. Available in 24VAC/DC & 90-240VAC, it can be surface mounted or pole mounted. Steady only or Steady & Flashing models are available.